15,529 Londoners driving without a licence have penalty points on their, well, record. Information obtained by the London Assembly Conservatives reveals the problem of illegal driving in the capital. The DVLA confirmed that of 69,353 unlicensed drivers in the UK as a whole who've got points, 22% are in London. 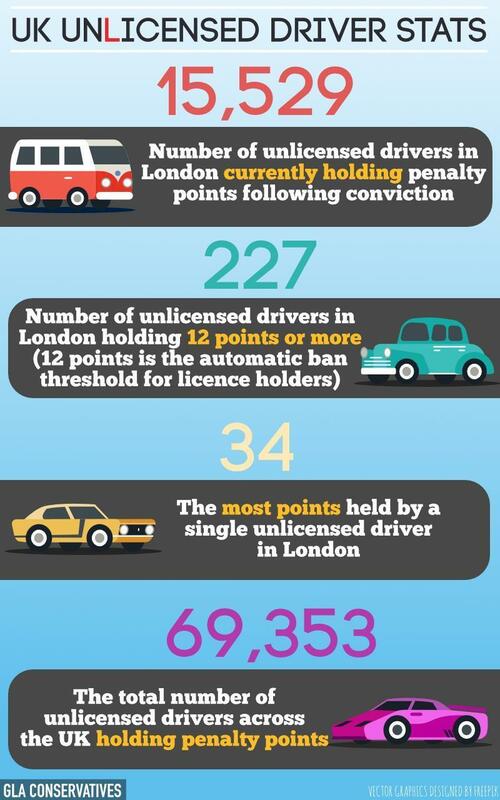 227 of these Londoners have enough points to have their licences taken away, if they had one. One person has amassed an incredible 34 points without having a licence. "It’s astonishing that anyone caught driving without a licence can get away with a fine they may not pay and penalty points that do little or no damage to their future driving prospects. This form of punishment falls well short of fitting the crime. We need strong deterrents to stop people getting behind the wheel of a car they are not qualified to drive." It is quite clear that anyone who's not bothered by the niceties of obtaining a driving licence isn't going to be all that bothered about racking up points. After all, you can get between three and six points just for driving without a proper licence. But most points are given for dangerous behaviour — and to people who, by definition, shouldn't be on the road at all. Steve O'Connell is right, the consequences should be greater.